For the past 3 years I have been taking an evening class once a week in an attempt to learn German. I studied it for 2 years at school and made virtually no progress at all – for some reason I found French easier to learn though I am hardly fluent in that language either far from it! I couldn’t get to grips with the German grammar back then, datives, genitives it made no sense at all. However with my enthusiasm for travel it has become extremely useful to know even a few simple phrases in a foreign language other than English and I find it really goes a long way to breaking the ice on my travels. So I have persisted and am now able to get by at least in restaurants, shops and on the transport systems when I’m visiting a German speaking country. Since my German course recommenced this week after the mid winter break (in Australia that is) I thought a German themed post would be the order of the day. Berlin had been on my wish list for years and I finally got to go there last year, which was excellent timing, as they were in the midst of their exhibition “Diversity Destroyed” (“Zerstoerte Vielfalt” – Berlin Das Themenjahr 2013), a reflection of the past and a memorial for the victims of the Nazi regime 80 years after the Nazi party had first come to power in 1933. Monsieur Le Chic had been lucky enough to visit Berlin in 1978 when it was a divided city and even more fortunate to go behind the “Iron Curtain” into East Germany. He got through the border post straight away with his British passport but his West German host family were considerably delayed at the check point before finally being allowed through to the East. Now with the coming down of the Wall in 1989 he was able to revisit a vastly changed city. Since I could write a whole blog in itself about this fascinating place, I have picked out one highlight which reflects modern Berlin and the direction its citizens are taking going forward. The Reichstag Building (Reichstagsgebaeude) is a fusion of Berlin’s past with its present and future. It was first built to house the Imperial Diet (parliament) of the German Empire and was used for this purpose between 1894, when it first opened until 1933, when it was severely damaged by fire. After this, in an ominous sign signalling the end of democracy, it was not restored. It was further damaged by allied air raids during the Second World War and thereafter became a major target for the Red Army to capture due to its symbolic significance. The Red Army flew their flag from the top of the building when they overran Berlin in 1945. During the time of the Berlin Wall it was situated almost on the border between East and West, technically to start with in the West but then inaccessible with the construction of the Wall and since the West German government had relocated to Bonn it remained a ruined shell for many years. Once German reunification had taken place in 1991 plans were made for the restoration of the building. The architect Norman Foster won the competition to redesign the site and eventually in 1999 the reconstruction was completed. The Bundestag (the German parliament) officially reconvened there on 19 April 1999. Not only has the reconstruction preserved much of the past it has also added a huge glass dome to the roof of the building which is a reference to the original 1894 cupola. The symbolism of the glass, we learned on our tour of the building, is to represent transparency and openness. During the day you can look right down into the parliamentary chambers and witness the representatives in session. At night you get the most wonderful vistas over the city imaginable. 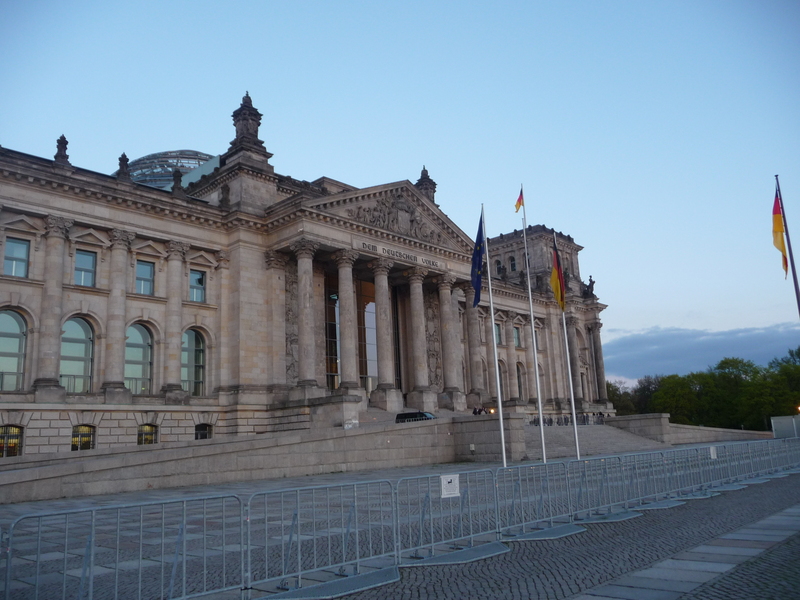 The Reichstag tour was one of the highlights of our 8 days in Berlin. You do need to book – although admission is free, advance registration is essential. We were very lucky in that the concierge at our hotel booked us in and we got a couple of places on the 9.15 pm night tour, on our last night in Berlin, which was all that was available. It turned out to be a very good time slot though, as we had dinner at the Bertolt Brecht Cafe on Friedrichstrasse just along the River Spree and then wandered over to the Reichstag building from there just a few minutes walk away. You do need to get there in plenty of time beforehand as you are required to go through a security checking process and you also need to take your passport with you (details will be taken when you register). Admission is daily from 8.00 am until midnight with last admission time being 11.00 pm. Definitely check out the Deutscher Bundestag website before visiting as the dome is closed for a few days every 3 to 4 months for maintenance although the roof terrace usually stays open except on 24 December and from 4.00 pm onwards on 31 December. Audio guides are available in ten languages (German, English, French, Spanish, Italian, Portuguese, Polish, Russian, Turkish and Dutch) and there is also a rooftop restaurant on the terrace to the east of the dome, open daily from 9.00 am to 4.30 pm and from 6.30 pm to midnight. We didn’t go there but I would imagine reservations are essential! Once inside the building you are free to wander around the dome and roof terrace at your leisure (lifts take you up there). Although you go in as a group you have no obligation to go round with everyone else. It was beautiful at night and provided some great photo opportunities too. I had to pinch myself to realise that I was in this building which had had such a turbulent and troubled history at times and was now so beautifully restored – a symbol of modern German democracy. The inscription on the front of the building is a motto for today’s Germany “Dem Deutschen Volke” which means “To The German People”! 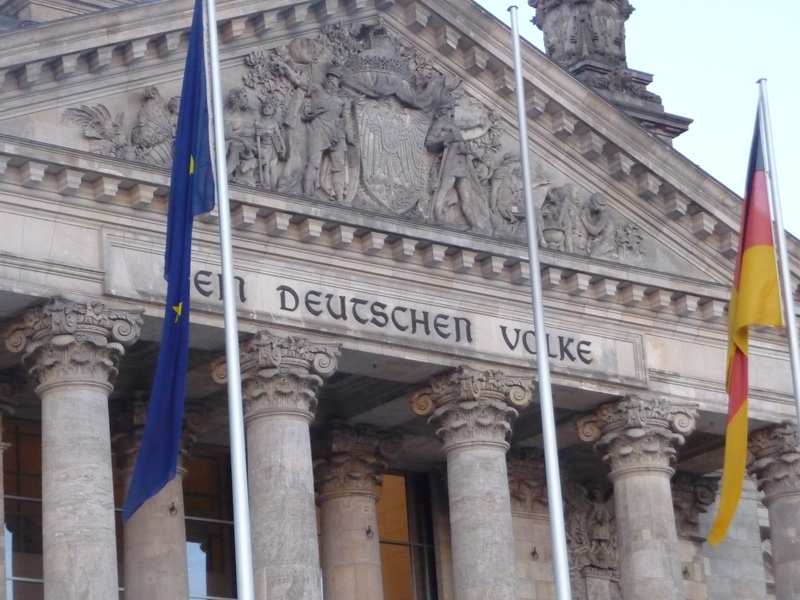 Inscription on the front of the Reichstag Building Berlin “Dem Deutschen Volke” To The German People. Sigh, how wonderful photos. 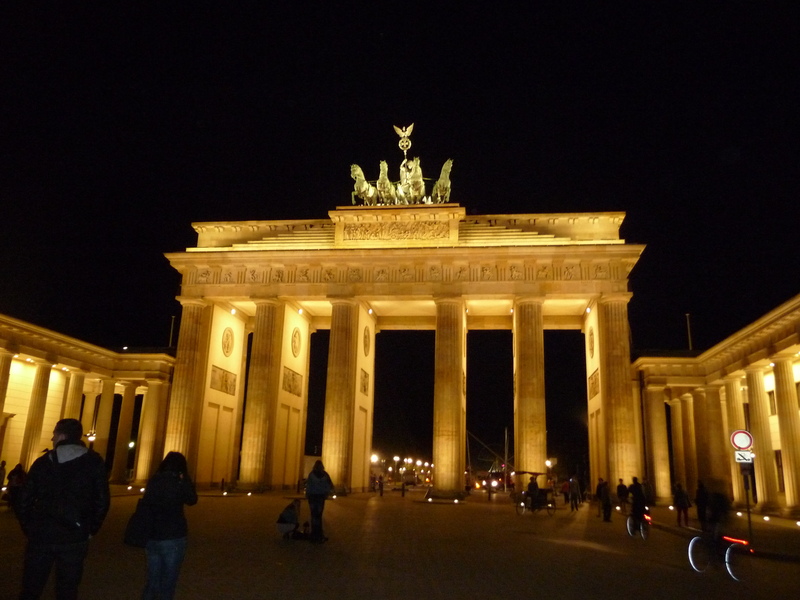 My favorite is The Brandenburg Gate.